The DTAG100-BLE smart beacon module from Dot Origin is an internal device that enables easy configuration and rapid modification of BLE beacon data via USB. Part of the well-established DTAG100 range of intelligent beacons and dynamic NFC tags, the DTAG100-BLE is designed to connect directly with digital signage, media players, PCs and other systems, offering complete platform independence without the need for software drivers or any knowledge of iBeacon or Bluetooth Low Energy beacon protocols or data formats. 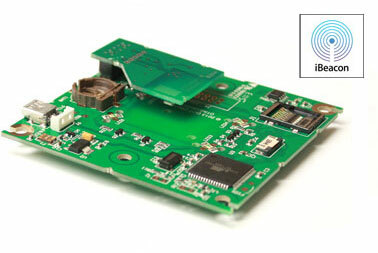 Unlike standard BLE beacons, which cannot be updated dynamically in the field, the DTAG100-BLE connects via USB and is designed to appear as a removable mass storage device. All configuration is via simple text files that can be edited manually or generated easily by host applications or add-on scripts. To compatible mobile phones, including the many iPhone and Android devices equipped with Bluetooth 4.0, it can appear as a standard fully-licensed Apple iBeacon, or as various other custom beacons, that can be changed and updated by the attached system whenever needed. It even has the ability to emulate multiple iBeacons simultaneously! With plenty of on-board flash storage, the DTAG100-BLE is also capable of intelligent, stand-alone operation, with comprehensive logging and monitoring features. As well as the usual iBeacon UUID, major and minor values, the DTAG100-BLE also enables application data to be transmitted back from the phone via Bluetooth, opening up opportunities for exciting new interactions and uses. The DTAG100-BLE is suitable for use in many applications including BLE-enabling out-of-home (OOH) advertising platforms and other digital signage products and solutions, as well as for interactive kiosks and payment applications. The built-in software-controlled hotspot highlighting LEDs can be used to enhance the user experience where appropriate, and a desktop enclosure and various other options for integration are available � please contact us for more details. The DTAG100-PRO is also available, which adds full NFC dynamic tag support. The DTAG100-BLE has been tested with a wide variety of phones and systems including Android, iOS, Windows and Linux. It comes complete with USB cable and links to full user documentation, developer guide and a comprehensive suite of demo apps for Chrome, iOS and Android, including source code and full technical support. The DTAG100-NFC dynamic NFC tag module that enables easy and regular updating of tag contents for digital signage, kiosks and other platforms, via USB. Comprehensive demos and documentation included.